There has been a lot of political spin recently regarding the removal of security clearances of high-level intelligence officials such as former CIA Director John Brennan by President Trump. The mainstream media has gone hog wild over this. As a long-time detective and law enforcement expert, I thought I would add a voice of reason and common-sense to the discussion. I am currently retained by a number of State Attorney Generals’ Offices and major municipalities as a forensic and law enforcement expert. In my capacity, I deal with restricted information on a daily basis. You know what? I don’t have a security clearance and I can assure you that I am dealing with far more sensitive issues than retired CIA Director Brennan is currently. During my long career as a police officer and detective, I was trained in and entrusted with how to access a variety of criminal and intelligence data bases. I needed to have this access to investigate crimes, criminals and persons of interest. This is a critical component of my job. When I retired and separated from my agency, my entrustment to access those data bases was removed. To this day, if I need to access even a Department of Motor Vehicles data base, I must go through one of the law enforcement agencies I work with. The operative word in this conversation is “entrustment.” Early on in our careers in the law enforcement and intelligence communities, we are trained that receipt of intelligence data, be it a simple DMV check; or high-level national / international intelligence is strictly on a “need to know basis.” When you separate from service, you no longer have that “need to know” and your security clearances are pulled. That’s logical and the way it should be in all branches of the law enforcement, intelligence and national security community. If we need the expertise of retired operatives for a specific mission, we can always pull them back in and temporarily reinstitute their security clearances. This should not be a complicated concept for anyone to grasp; especially for high-level retired or fired former law enforcement, intelligence and military officials like John Brennan, James Comey and Admiral William McRaven. The obvious argument here is entrustment versus entitlement. So then why press the issue? Well, here is where politics rears its ugly head. The access and use of intelligence information or one’s former position as an operative should never be weaponized or monetized and that is exactly what bureaucrats like former CIA Director Brennan and those like him have done. Keeping politics out of intelligence gathering so that agencies like the CIA, NSA, USDOJ and FBI can remain apolitical and credible should have been the focus of our Presidential administrations a long time ago; but it wasn’t. When the “Old Boys Club” of intelligence officials and complicit politicians created the dogma of entitlement over entrustment, we were eventually going to arrive at the controversy we have today. As a professional who currently defends this nation and who has worked with the Navy SEAL community; I was extremely disappointed with retired Admiral McRaven’s vocal support of John Brennan. The one thing I have learned from my relationship with the SEAL and Marine Corps Communities is the strong and instilled belief in what is referred to as Core Values. Core Values include loyalty, honesty, integrity, patriotism, ethics, and an unwavering belief in God and Country. In my humble opinion, the behavior of Mr. Brennan and those like him reflect poorly on those Core Values. The fact that former SEAL commander McRaven supports Brennan and refers to him as a man of integrity, reminds me that as one climbs up the G-scale and transitions from operator to “bureaucrat,” they have a tendency to misplace some of their Core Values. I have learned that the ends rarely justify the means. Former CIA Director Brennan has lied to and/or deliberately misled Congress on more than one occasion. He has accused President Trump of treason without a shred of evidence and has used his standing as a public figure with a high-level security clearance to further bootstrap his credibility with the media as a frequent paid pundit. He has weaponized the intelligence system and severely damaged the security of this nation. To Brennan, he has personally done more damage to the credibility of our President to the ignorant nationally and internationally than Vladimir Putin and his regime operatives have. Even former National Intelligence Director James Clapper, who is certainly no fan of President Trump has recently criticized Brennan’s actions, referring to him as an out of control freight train. As a former cop, I tend to keep it simple. 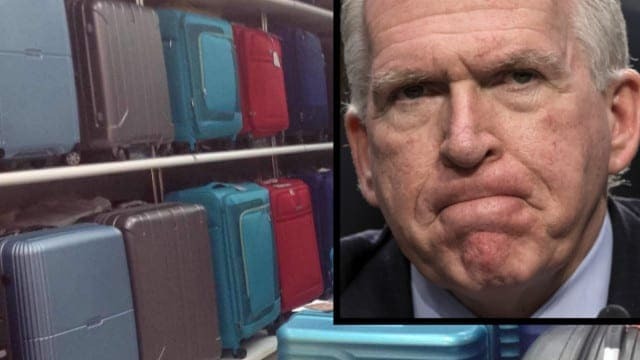 John Brennan’s got more political baggage than a Samsonite factory. The question that you and the mainstream media should ask yourselves is that with all Brennan’s problems, would he even pass the basic background check to become a police officer? The answer is a resounding NO! If not, then why are some people arguing that Brennan and the rest of the members of the Resist Movement keep their security clearances? This is not rocket science. The obvious answer to the recent security clearances conundrum is that Brennan and his supporters place politics over the people and our national security. This is a national disgrace. If President Trump is wise, he will author and sign an executive order mandating that the security clearances of all federal employees separating from service will be automatically removed until which time their services may be required in the future. In such cases, those security clearances would be temporarily reinstated until the end of assignment. It’s really as simple as that. It is apolitical and the right thing to do to protect our nation and its people. I would look very skeptically at anyone who would argue that point.